You can make beaded tassel earrings long or short, thin or full. The most important aspect is that beaded tassel earrings should have movement - they need to swing when you turn your head and sway with smaller movements. These tassels have bright red glass leaf accent beads that look like hearts on the end of each strand. The accent beads provide a little extra weight on each tassel to keep them straight and add a pop of color. The only way to get tassels that hang properly is to use the right thread and appropriate tension. For these tassel earrings, use Nymo size D or a similar nylon beading thread. Fireline or Wildfire are way too stiff to provide tassel movement. Prepare your needle and thread by pre-stretching and conditioning with thread heaven or beeswax. These earrings use cone findings to hide the area where the tassels join at the top. You can use a bead with a larger hole instead of the cones. When using a cone, you can use an eye pin to hold the strands together, but this could be a jump ring or the earwire if you are using a large bead in place of the cone. Aside from the cones - the materials used are size 11 delica seed beads, one size 8 seed bead, thread, needle, accent beads for the tassel ends (optional) and a pair of ear wires. The amount of thread you need will depend on the number of tassels in your earring. These completed earrings are long - about 9 cm or 3 3/4 inches. This design makes all of the tassels with one piece of thread - so make sure you have a long enough piece for as many strands as you plan to have before you start. This project started with about 4 feet of thread, but there was plenty left over. Pick up the beads for the length tassel you are making, including an accent or turn bead at the end. The red leaf bead is being used as the turn bead. To accommodate the top center location of the hole in the red accent beads, string an extra three beads after the accent bead to cover the hole. See this article if you'd like more information on how the design for these earrings occurred. If you are using an accent bead that requires some extra beads to cover the length from the hole to the tassel, insert your needle into the fourth bead and up the entire row of beads in the opposite direction. If you are using a single turn bead at the end, you will thread into the second from the last bead and up the entire row. For example, you could use an accent bead, a seed bead, then go back up through the accent bead and the rest of the strand. This picture shows you why there are three extra beads after the red accent bead and into the fourth bead to complete the fringe. The extra three beads on each side are being used frame the accent bead and hide the hole. Before learning this trick, there were a lot of beads that were difficult to use because of the location and direction of the hole. To join the tassels at the top, as each one is complete, thread them through a size 8 seed bead and then through the eye pin. To start the next tassel, make sure the first tassel is flush with the size 8 bead, but not so tight that the beads are cramped. The beads should stack neatly with no gaps. When the tension is correct, start the second tassel by going through the size 8 bead and picking up the appropriate number of seed beads for the next tassel. Follow the same steps as you did on the first tassel, thread through the larger bead and through the eye pin until all tassels are complete. The tassels for these earrings are 32, 40 and 48 beads long, plus the 9mm leaf bead. To tie off the tassels, make a square knot with the working thread and the tail. Use a dot of Hypo cement or crazy glue to make sure the knot is secure. If you are using bead cones, cut the thread ends and thread the cones on the eye pin and add a wrapped loop above the cone. If you are using a large bead instead, once you tie off the threads and glue them, pull your working thread through the large bead to pull the knot inside and then cut the threads. Add the ear wire by twisting the loop open to the side with your pliers and sliding on the tassel. Close the loop of the ear wire by twisting in the opposite direction. 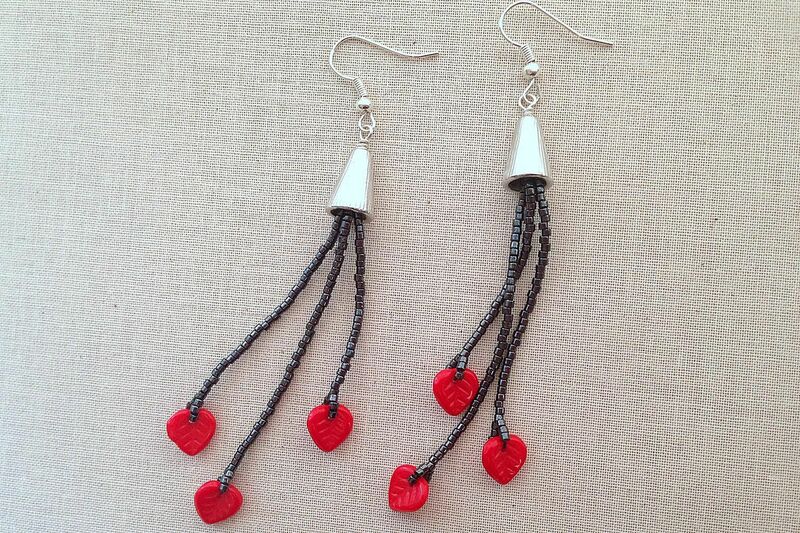 Enjoy your lovely heart tassel earrings! If you like the long, swingy look of these tassel earrings, try these updated brick stitch earrings.